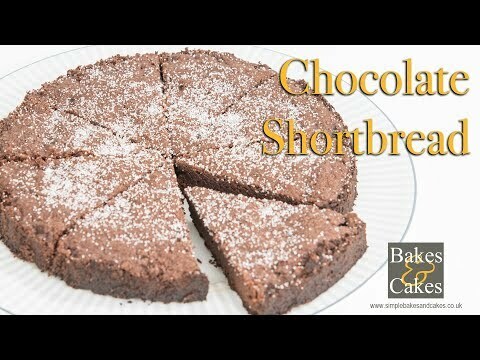 I love this chocolate shortbread but you have to be careful when baking it. Bake it too long and the cocoa powder will burn and turn the chocolate shortbread into a bitter tasting unpleasant mouthful. When I first baked this shortbread I tried to make it in a square baking tin but now I prefer using a as I find it makes the presentation of the biscuits look better. Cut into triangular pieces, the shortbread looks tastier! Don’t ask me why I just said that, but I think it does and it makes me feel less guilty about eating more biscuits. bake in the centre of the oven for 25 minutes or until only just firm. Leave to cool then remove and store in an airtight container. Another way of presenting this shortbread is to make them in a classic way as Paul Hollywood does in his book . His recipe is here. I have a shortbread biscuit recipe where they are cut into rounds and decorated with Demerara Sugar which gives the light shortbread biscuits and lovely sweet crunch. It really depends on the type of biscuit you are looking for.